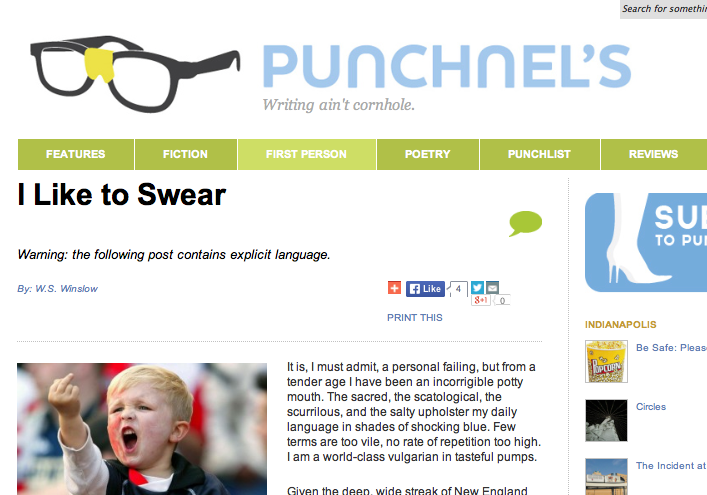 The fine and clever folks over at Punchnel’s have seen fit to post a meditative little essay of mine entitled, I Like to Swear on their excellent site. Please do drop in and have a look. There’s lots of great stuff over there, including, but not limited to, rants about the Grateful Dead, Con Chapman’s Releasing Your Inner Big Foot, fiction, poetry and reviews. The site is chockablock with great reading material. And really, wouldn’t you rather be teasing your brain with lots of top drawer writing than staring at spreadsheets, slumping disconsolately at your desk or pretending to enjoy playing Barbies with your kids? My piece even includes an explicit language warning and the teaser, “W.S. Winslow works blue.” So in addition to being amused and perhaps a bit scandalized — and really who doesn’t enjoy the illicit frisson of a good scandalizing, especially on a Monday morning? — you can share in the satisfaction of my little exercise in pushing the limits of the First Amendment. Post a clever comment, reblog, send it viral. Have at it ferchrissakes. Posted on December 9, 2013, in Commentary, Life and times and tagged Barbie, clever folks, First Amendment, Grateful Dead, Kitchen Slattern, Profanity, Punchnel, Punchnel's, Reading, Slattern, Swear. Bookmark the permalink. 8 Comments. Alas, I am not a profanity-ridden harlot, but your article is funnier than sh*t(e) which might explain why you haven’t been posting lately. Congrats! PS: For your amusement, I’ll have you know that I’ve a gig writing articles and press releases for a Russian/China bride dating site. (No f*ckin’ sh*ter-ama.) For as much as one would pay for a foot massage with an under-fed, under-aged third-world child whose salary per day is less than our manicures, I’m imploring the sad lonely male saps of the western world to marry the blood-sucking overseas bride of their dreams. You are NOT serious. SEND ME THE LINK. Wendi. I swear and have given up using it for shock value. Now it is part of the language. Maybe it’s more shocking and subversive if you DON’T swear. Rebellion takes many forms, my friend. Thanks, Carrie. You’re a better human being than I am, but then again, who isn’t? Ha, you make me laugh, so that balances everything out.